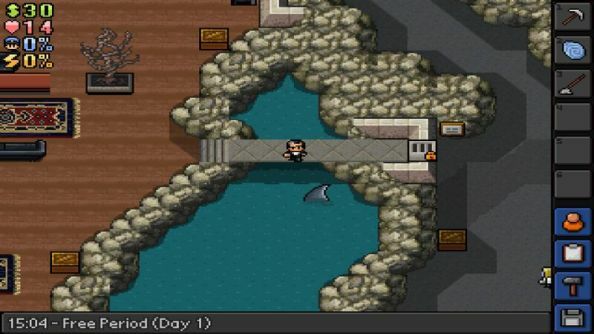 If The Escapists: The Walking Dead finds Team17 flipping the formula like a mattress in a cell search, then Duct Tapes Are Forever sounds like original sandbox sim’s last hurrah. Developed by indie outfit Mouldy Toof, the Spectrey DLC will plonk us in the underground lair of a heinous villain and ask us to draw on all of our experience in great escapes. Looking for undirected fun? Here are the best sandbox games on PC. Duct Tapes Are Forever consists of one timely new map, six achievements and a leaderboard totalling £2.99, $4.49 or 3,99 €, and comes to PC this Tuesday, November 3rd. You’ll need to muster all your “spy cunning” to sneak into restricted areas without raising suspicion and gather the items necessary to pull of an “explosive” exit. Team17’s Escapists Walking Dead spin-off is an almost opposite affair, putting the player in control of the camp for the first time and leaving them to maintain order. But original developers Mouldy Toof aren’t involved in that project, and are evidently busying themselves crafting items in the same vein as vanilla Escapists. Think you have it in you to conceive one more plot while sticking to schedule?